A Buyer's Guide to Under-Cabinet Lighting Design And Concept. - 12Vmonster Lighting and More! A Buyer's Guide to Under-Cabinet Lighting Design And Concept. Under-cabinet lighting has enhanced many kitchens since the 1970s. Back then, incandescent and fluorescent lights have been the only options. 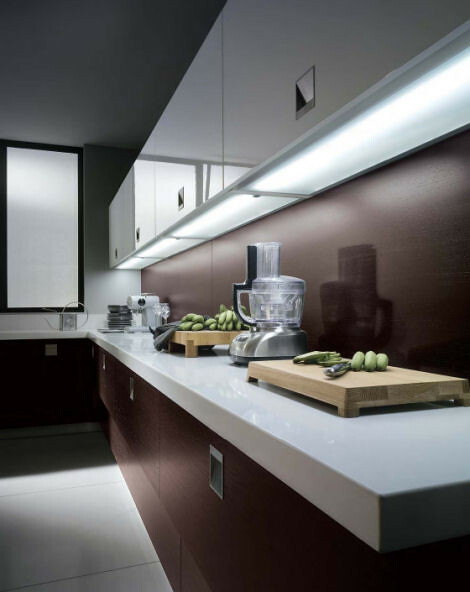 As halogen moved up as the main choice for household lighting, so does under-cabinet lighting. Nowadays, LED is the most popular options, for many reasons we've discussed in our previous articles. The technicals surrounding the under-cabinet lighting also evolved with the lighting choices. Yet, the principle stays the same, not only under-cabinet lightings improve the aesthetics of your kitchen, but they also enhanced its functionality, assisting preparation and the cooking activity itself. We'll guide you step by step until you got your perfect under-cabinet lighting, starting from choosing your color temperature. As we can see, colors are measured in Kelvin temperature. 1,000-3,000 Kelvin range is the warm tones range. You may have heard the term 'warm white' before, it belongs to this group, and warm white lightings are measured in 2,700-3,500 Kelvin. 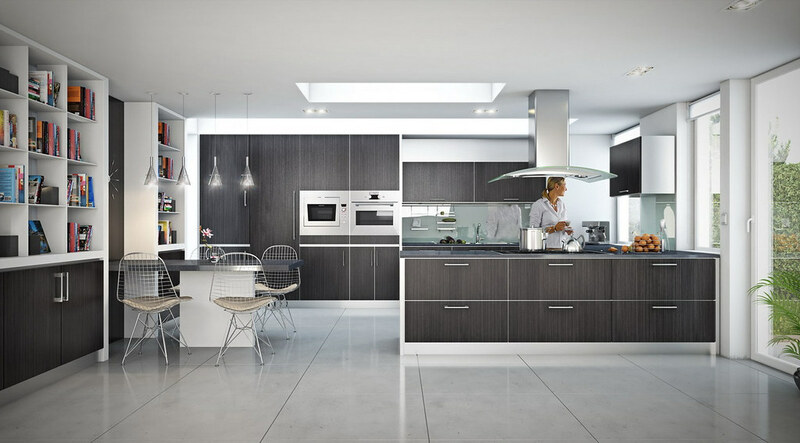 More modern toned kitchen with white and softer color cabinets or steel/aluminum cabinets will be accentuated better with cooler light. Go with lighting close to the 5,000 Kelvin range. Next, we move on to the types of lighting. Today's fluorescent doesn't produce any hum, and there's no delay when powered up, unlike their 1990s predecessors. Generally, they are available in 3000K, 4100K or 6400K color choices, so you can choose the one that fits your countertops better as mentioned in the previous section. It's hard to find an advantage of fluorescent, as many of its good qualities are replicated, if not surpassed by longer-lasting LEDs. The thing is, fluorescents can be a lot cheaper than LEDs at the moment, and can certainly be a reason. Puck lights are popular because some of them are battery powered, eliminating the headache associated with the wiring installation. Available with Xenon, LED, and halogen light sources, but the Xenon ones are generally undesirable for kitchen use because they tend to burn hot. Low-voltage versions are also available, but you will need a transformer to power it. There are also cool ones with motion-sensors equipped, that will flick on with a detected movement within five feet. 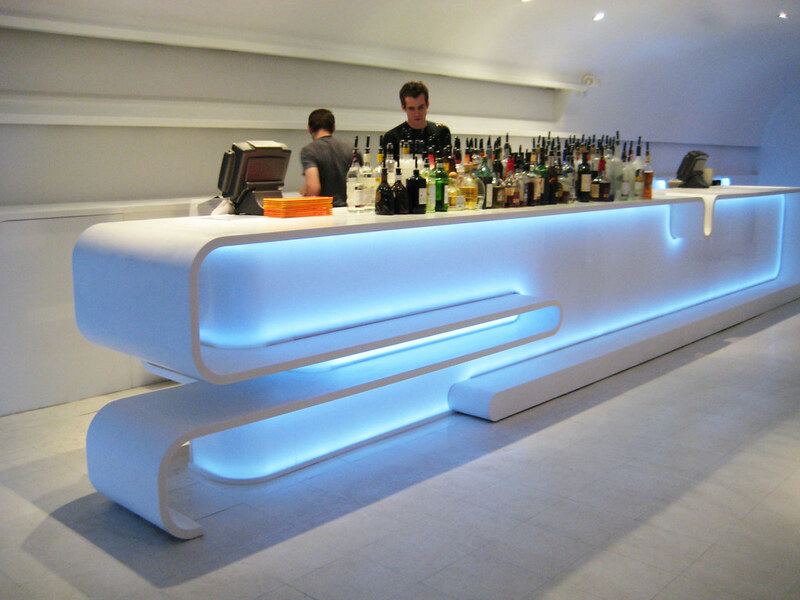 There are light bars dedicated for under-cabinet use, allowing very easy installation as well as a modern, beautiful design. However, as it's fairly new, it is fairly expensive, with the price pushing close to $30 for a 12" bar. Under-cabinet lighting won't require that much power. However, you should be careful that it won't overload a power source. If you are deciding in using battery-powered puck lightings, you can skip this step. Depending on your country's electrical code, not all power source will be available. For example, the U.S. electrical code prohibits connection to dedicated circuits. This roughly means that you can't use your kitchen and dining appliance circuit (you can't use the countertop power outlets), as well as your laundry room and bathroom circuit. If such condition is applied to your location, it's still legal to take power from a light switch box with all hot, neutral, and ground connection. Otherwise, you'll have to take the power from other locations such as your hallway outlet. Turn off the circuit you are planning to use. Add the wattage of the planned under-cabinet lights. Make sure there is at least 20% spare power capacity, for example, the maximum wattage for a 20 Ampere circuit should be 1920 watts. Interested to install your under-cabinet lighting, and looking for the help of a professional? You don't have to! The installation is easier than you thought, and can be done with fairly simple tools already available in your household. Here is a YouTube tutorial from Southern Girl Interiors for LED puck lights. Pretty comprehensive and easy to understand. For those who prefers tutorial in written form, here is an excellent one. This one is for bar application, but can easily be applied for kitchen use. Another one in written by Family Handyman, a bit more technical for you who prefers that way. Now you got all the basics covered and you're ready to install your own under-cabinet lighting system. Check out our collections for under-cabinet lighting here,we have many selections available from halogens to LEDs to touch-activated options.